More College Presidents Join The Millionaires' Club : NPR Ed Sixty-six university presidents took home more than $1 million in 2015, according to a new analysis by The Chronicle of Higher Education. At No. 2, James Wagner of Emory University received $3.5 million in compensation because of a similar deferred compensation plan. At No. 3, C. L. Max Nikias of the University of Southern California earned a $1.5 million, one-time bonus, nearly doubling his pay to $3.2 million. Daniel Curran, meanwhile, retired in 2016 after serving 14 years as the first lay president of the University of Dayton in Ohio, a Catholic institution. He took home more than $2.4 million in 2015, landing in the No. 8 spot. Just below Curran, Joanne Glasser departed Bradley University in Peoria, Ill., with a $2.1 million severance package on top of her $200,000 in base pay. And David E. Van Zandt of the New School also got a one-time deferred compensation package. When you look at base salary alone, other patterns emerge. The colleges with the highest-paid presidents year to year, not surprisingly, tend to be highly-ranked urban, private institutions: Columbia University in New York, the University of Pennsylvania in Philadelphia, and the USC in Los Angeles. Amy Gutmann at the University of Pennsylvania and Glasser are the only two women in the Top 10. The American Council on Education says that only 17 percent of college presidents are not white; few executives of color appear on this list of the highest-paid. The highest-paid public university leaders, meanwhile, are Michael Crow of Arizona State University and William H. McRaven, chancellor of the University of Texas system. At about $1.5 million, their compensation packages put them at Nos. 22 and 24, respectively, on the combined list. 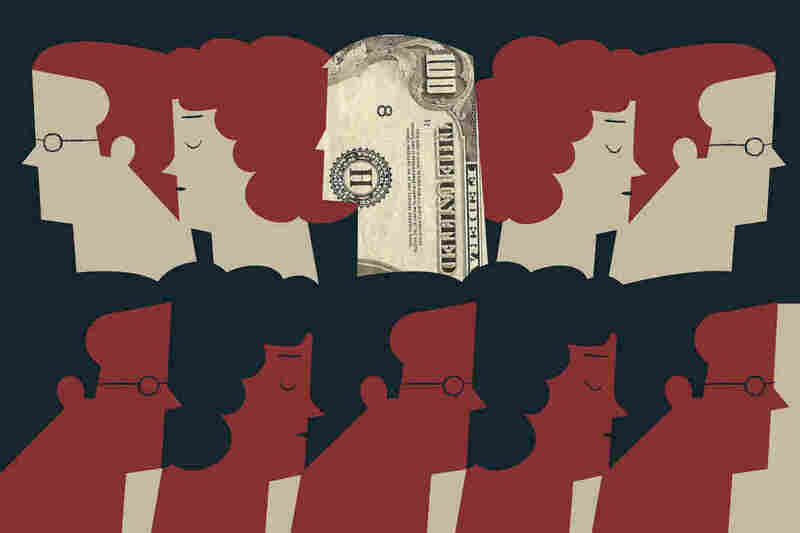 At a time when the cost of college and the burden of student loans weigh heavily on many families, college president pay can stoke resentment. Most of the institutions at which executives earn a lot of money also have high tuition — but use their resources to reduce student borrowing, too. Nationally about seven in ten students take out loans for an undergraduate degree, but at the 10 schools with the highest-paid presidents, all private colleges, the average was half that. Only 36 percent of their students borrowed at all, and their average debt was around $22,000 — compared with an average loan burden around $32,000 for all private nonprofit colleges. NPR contacted the press offices representing the 10 highest-paid presidents, asking for comment. Most emphasized the important contributions their executives had made. Wake Forest Board of Trustees Chair Donna Boswell pointed out that Wake Forest has raised more than $795 million during Hatch's tenure, making him a good return on investment. David L. Cohen, the chair of the University of Pennsylvania Board of Trustees, told NPR: "Amy Gutmann's salary is based on the market that exists for research university presidents, the unique complexity of leading Penn and the extraordinary job she has done as our President. The Trustees believe she is the best university president in the country and that her salary should rightly reflect the stellar leadership she has brought to Penn." When trying to put these numbers into context, it's also worth noting that another class of employees in higher ed is in a different, well, league, when it comes to compensation. That would be college football coaches. According to USA Today, the top 10 highest-paid NCAA football coaches earned between $5 million and $11 million in 2016.